The past couple of weeks in our house have been hectic. Nothing major has happened, it’s just that our activity level has increased with the outdoor temperatures. As a result, it’s been more of a struggle to get healthy, homecooked meals on the table every night. And for some reason, though I love my crockpot, I don’t like to use it as much when the weather is warmer. I’m also trying to find recipes my kids can make. First, because I want them to learn to cook so they don’t starve to death when the grow up and move out. Second, because they tend to complain less about what I serve when they have their own time and effort invested in getting dinner on the table. 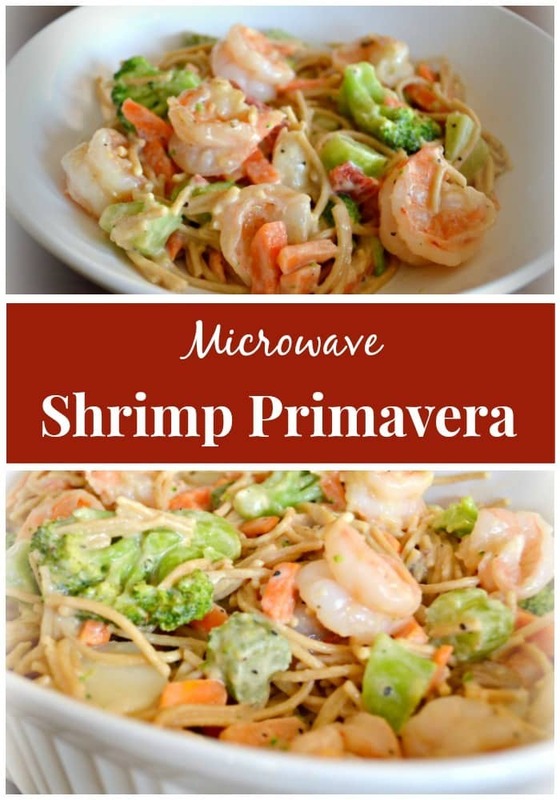 That’s how we came up with this shrimp primavera recipe that can be made entirely in the microwave. Also, because I wanted the kids to be able to make it with or without supervision, there’s no cutting involved. Remove shrimp from freezer and follow instructions for thawing. 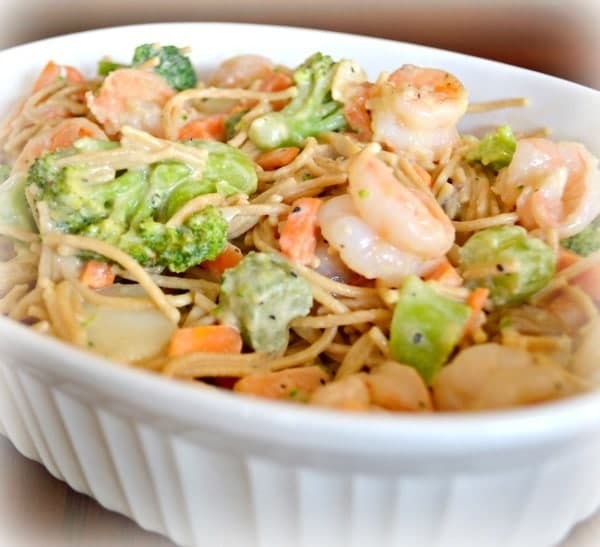 Break noodles in half and layer them on the bottom of a microwaveable casserole dish. Sprinkle garlic powder and lemon pepper over the noodles. Then pour broth and cream over them. Cover and microwave on high for 7 minutes. Remove carefully from microwave and stir well. Cover and microwave on high for an additional 7-9 minutes until noodles are tender. Remove casserole dish carefully from microwave and add cream cheese and parmesan. Mix well. Stir in vegetables. Cover and microwave for 4-5 minutes until vegetables are heated through. Add shrimp and mix well. Serve immediately. I like to make this meal as healthy as possible, which is why I use whole wheat pasta, milk, 2 packages of vegetables and I go easy on the cheese. 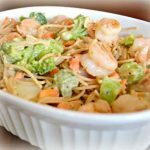 You can adapt this for pickier eaters by using regular pasta, heavy cream instead of milk, half the veggies and double the cheese. I’d never dream that dish came out of the microwave! Thanks for sharing at Bloggers Brags. I am pinning to our Bloggers Brags board on Pinterest! We hope to see you again this week! Sounds easy and amazing. Wow. I found your recipe over at the Two Cup Tuesday link party. I host Tickle My Tastebuds Tuesday and would love it if you would come over and share this recipe. I’m sure our party goers would love it! Here is the link http://bit.ly/1EylfPQ. Have a wonderful day! I am so glad that you shared this recipe on Making Memories Mondays! I plan to make this on Friday night! 🙂 PINNED! I was happy to share it at your party! I found so many great posts there to pin too. Thanks for stopping by! Oh my goodness, this looks delicious! I am currently 9 months pregnant, and looking for healthy, yet tasty dishes that are, most importantly, easy to make. This is definitely going on the menu next week! Thanks! This looks so delicious. 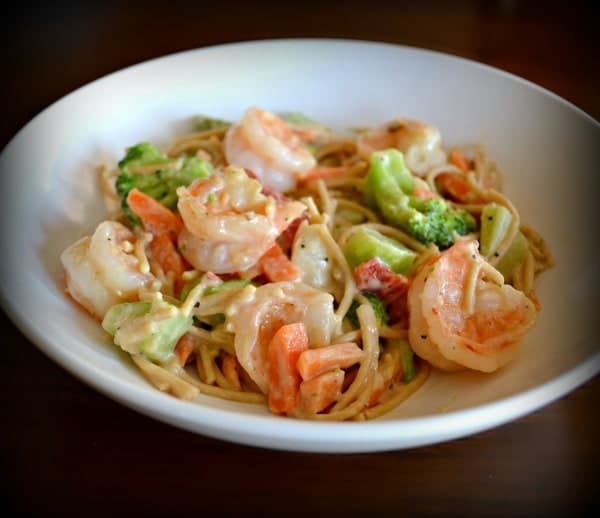 My family loves shrimp meals and could eat shrimp almost every night of the week. I think it is smart that you are teaching your children to cook – so many children leave home and don’t know how to cook good, healthy dishes. I will give this a try on my family – I know they will love it! Corinne, this is the perfect recipe for so many situations. For living in a temporary kitchen during a reno. For nights when the kids need to make their own dinner. For busy nights when I’m in a rush. For when we’re moving and living with minimal kitchen equipment. Pinning this now! Susan, I have to admit I feel like I am cheating at homemaking when I make this because it is SO easy. I love all the colors and it comes out so flavorful though that the guilt is short lived. I hope you like it as much as we do.